Washington mourned the death of Ronald Reagan this week. While sentimental and opportunity for people to pay last respects, the mourning struck me, as it always does, somewhat misplaced. Why show so much respect for the dead when the living could use it more? I understand that Alzheimer’s gripped the former president and that maybe he couldn’t appreciate friends or fellowship the way he used to. What about the family? Particularly considering the seriousness of his illness? I’m one of those people who viewed Nancy Reagan as cold and aloof. But I do respect the way she protected her husband’s dignity and his memory as president during the last decade of his living. If you can call it that. I stayed out of the city during the commemorative week. I voted for Reagan, even if I didn’t always agree with his policies. 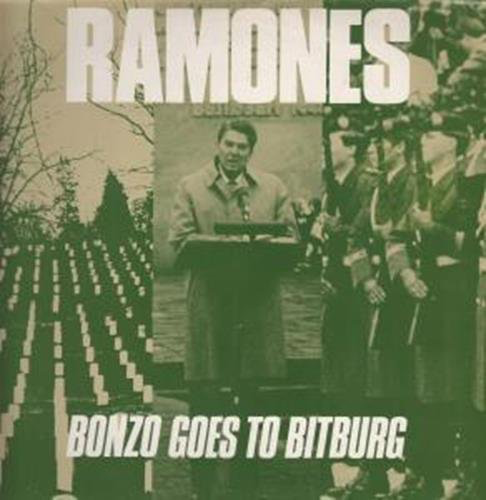 Yesterday, I celebrated by repeatedly playing the Ramone’s “Bonzo Goes to Bitburg”. I always liked that song, for the tune and for its biting political lyrics—rebellion and protest that nurtured the original punk rock generation (Sorry, Nirvana, you’re naiveté is pronounced, by comparison). The song protests Reagan’s visit to a German memorial with Nazi ties. Not necessarily one of his better decisions, but sign of his statesmanship.